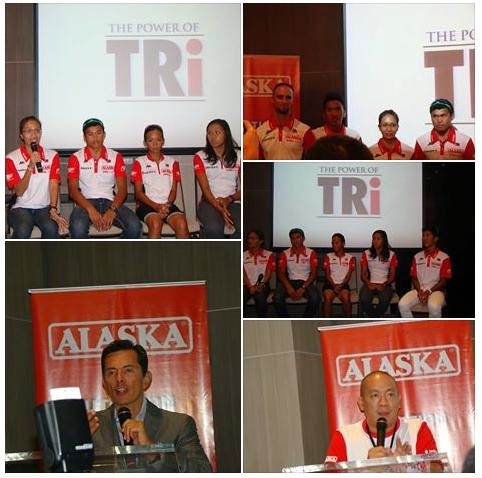 "The Power of Tri: 3 Weekends, 3 Great Sports Events” Press Conference earlier at the Seda Hotel, Bonifacio Global City unveiled three days of thrilling cycling events and Sunrise Events to launch the Alaska Cycle Philippines. 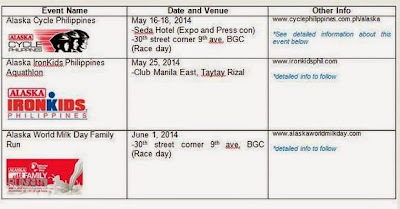 While the focus of the launch is on the Alaska Cycle Philippines happening tomorrow, May 17 for the Children’s race and May 18 for the adults, the event outlines the three Alaska Sports Events happening in three succeeding weekends starting on May 17 until June 1. In addition, the Alaska Tri-Aspire team was launched formally as newest member of the Alaska Sports Family. This Alaska professional triathlon team of Alaska is composed of 2 of the world’s best professional athletes plus 5 Filipino Elite Development Athletes. The Filipino Elite composed of Banjo Norte, Jenny Rose Guerrero, JonardSaim and Juan Carlos Abad will train under Coach Mathieu O’Halloran’s guidance to become a world-class team The team aims to produce legitimate professional athletes that can be competitive in 5i50, 70.3, Ironman distance, and XTERRA events. These athletes will be the official Philippine representives in the upcoming Asian Beach Games, Asian Games and Olympic Games. Three sport events will compose of swim, bike, and run events – Alaska IronKids Philippines Aquathlon, Alaska Cycle Philippines, and Alaska World Milk Day Family Run. Alaska Milk Corporation believes that sports play an important role in instilling the values of determination, discipline, hard work and team work among the youth. These fundamental values develop character and are necessary attributes for success as much as good health and proper nutrition especially through milk. Alaska’s Sports Development Program is a holistic approach to Sports Marketing that adheres to mother’s natural instinct of wanting only the best for her children. She does this by promoting proper nutrition, an active lifestyle, and placing emphasis on the importance of character-building. This is what Alaska Milk Corporation believes and encourages: NUTRITION.ACTION.CHAMPION. Do check out the line up of Alaska sports events which culminates on June 1. The Alaska elite team is mainly composed of Filipino athletes because Alaska Milk Corporation believe in developing and nurturing grassroots talents. Let us support the Alaska Tri-Aspire Team by waving the Philippine flag at the races they will conquer. Their fearless determination and steadfast discipline will surely bring them closer to monumental victories Filipinos around the world will be proud of. I always love such great sport events. 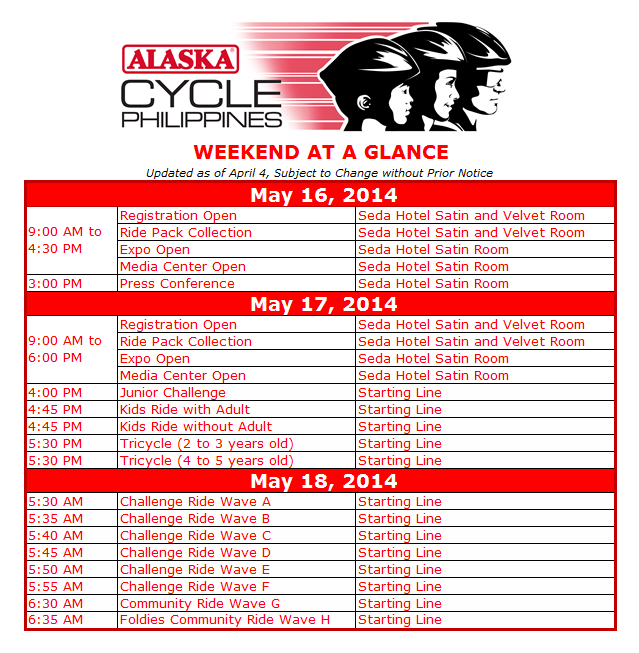 An event for sports dedicated and sponsored by Alaska. Time to acknowledge this kind of event for youngsters. whew! triathlon.. i hope i can swim for reals.. This just shows that Alaska has been all around when it comes to sports. We have just been caught in traffic because of the Alaska biking event yesterday haha they are so good to look at. Bikers with different backgrounds participated and had fun. I'm so glad that the sports scene here in the Philippines is so alive! It's nice that Alaska's team is mainly composed of Pinoy athletes.